At the wake of Cheryl Burke Dance closing, the new Starlite Ballroom opens. Reenter: Michael Reeves, former owner of the old Starlite, back to rekindle and coax the old Starlite denizens back to the fold. In 2007, urban creep gobbled it up and they had to move. For over a year they searched for a replacement and he partnered with Sherri and Cheryl Burke to rebuild and rebrand as Cheryl Burke Dance. But…CBD never captured the old spirit, there was a different style and focus of management and so he lost his heart. And…the veteran dancers felt it, never again would it capture the hearts in the numbers that Starlite used to have. CBD still was large, at 14,000 sq ft, but growing in separate phases over a couple of years and losing Michael on the 2nd year, it lost the Starlite momentum and could not maintain the same interest and consistency in the long term. But…the die-hards stayed and it was still a substantial following. Now, Cheryl Burke Dance is closed, deciding to exit the business after they lost the lease when the development was swallowed up by another Silicon Valley office park campus, this time LinkedIn. So… the die-hard dancers now need to find a place to go. Meanwhile: Enter the new Starlite Ballroom. 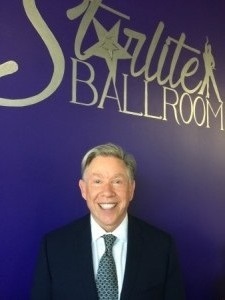 A group of international competition champion dancers in Latin and Ballroom decided to get into the ballroom business and hire Michael Reeves’ business consulting firm to help set it up. Daniele, Cecilia, Andrea and Iveta are also the organizers of The Diamond Classic Dance Competition in San Jose, CA, the largest and most exclusive One-day Ballroom Dance Competition in the Bay Area. They remembered the feel of the old Starlite and wanted to replicate that ambiance. Not knowing the eventual fate of CBD, they were just counting on opening an addition to the Bay Area dance scene. The new Starlite took a while to find a home. Due to dance studios’ specific needs regarding column spacing, location convenience needs, assembly parking and zoning requirements, and the very busy permits department of Silicon Valley, it also took over a year from conception to completion. It is located in 5178 Moorpark Avenue #60 San Jose, California. It is 4, 500 sq ft and has a single floor. As luck and happenstance has it, their grand opening is the week after CBD closes. As they say, timing is everything…so now what? While Michael Reeves continues to run his dance industry consulting business, keeping 11 of his previous clients, he is now the Starlite manager. In charge of the social scene, he aims to recreate the feel and community of the old Starlite while the owners focus on the competition training aspect of the business. Michael has returned after a couple of year stint in Atlanta owning 2 dance studios and the Hotlanta ballroom competition, then cuts short his 2 year planned stint in Indianapolis running 3 small to medium size studios to move back. He is excited about what comes next. He plans on completing the memorable Starlite twinkle lights within 4 weeks. He says it takes about 3 weeks to work it. He is busy setting up for the grand opening on Saturday, Oct 10th, expecting about a 100 to 150 people. Group lessons begin at 8:00P and the dance party is at 9:00P-Midnight. It will be punctuated by showcase dances of the pros and Dan Dan Tran will have DJ honors. Door fee is $10. Already in his roster of dances on November, aside from the ballroom staple, is Miguel De Sousa for beginner and intermediate West Coast Swing on Thursdays and Pantea resuming her Sunday Salsa curriculum from CBD. In addition, the coup of the fallout, he has gotten the most sought after ballroom DJ, Dave Ingalz to agree to his Friday and Saturday dances. When asked what if it’s not big enough, he says that the strategy is always to test first and grow with demand. He is already eyeing the school next door which he thinks is around 3,000 sq ft, and hoping to fulfill a need in the next year. Author: Gina Katigbak, avid social dancer and dance maven. 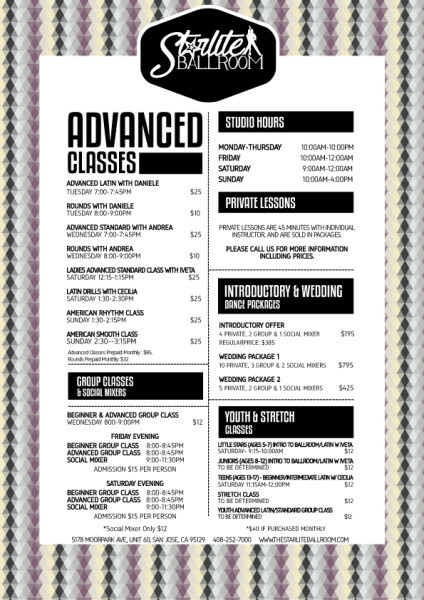 Go to www.DanceMaven.com to find where to dance in the San Francisco Bay Area. 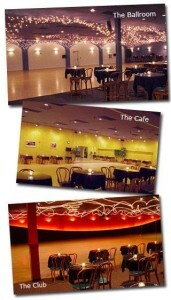 Flashback 2001 to 2007, Michael Reeves with 2 partners, Craig Lynch and founder, Joe Metz, owned the most beloved ballroom in the Bay Area located at 1160 North Fairoaks Ave. Sunnyvale, CA. Dancers still wax nostalgic about that place. None ever replaced it in their hearts. It was 17,000 sq ft with 3 ballrooms. 2,000 people went there weekly.